As the Brexit process nears its current end-date without the UK reaching any solid resolution, the Pound Sterling to Euro (GBP/EUR) exchange rate has failed to sustain any gains. Markets are highly anxious as a fresh delay to Brexit still has not been confirmed. Last week saw GBP/EUR open the week at the level of 1.1625, and the pair trended higher for most of the week amid hopes that a softer Brexit could be achieved. GBP/EUR briefly touched a high of 1.1754 in the middle of the week. However, with under a week until Brexit will take place and no deal reached, GBP/EUR tumbled lower before the weekend and markets ultimately closed at the level of 1.1619 – a little lower than the previous week’s levels. GBP/EUR continued to trend near those lows at the time of writing, as investors remained hesitant to make any big movements on Sterling ahead of expected Brexit developments this week. This Friday is still currently set as the day on which Brexit will happen and the UK will formally leave the EU, but as no withdrawal agreement has been agreed by UK Parliament, the default outcome is still a worst-case scenario no-deal Brexit. Markets fear that this outcome, which would be like a cliff-edge scenario for UK businesses and trade, could have a big negative impact on Britain’s economy. Concerns that a no-deal Brexit was still possible prevented the Pound from sustaining any gains last week, ultimately overshadowing market hopes that Prime Minister Theresa May would be able to negotiate a softer Brexit plan with opposition Leader Jeremy Corbyn. However, while investors are anxious that a no-deal Brexit is possible, this is largely limiting Pound (GBP) demand rather than causing broad Pound weakness. This is because investors still believe another delay to Brexit is more likely than a no-deal outcome. Essentially, investors are hesitant to make big movements on Sterling as they hope a Brexit delay will be confirmed, but anticipate developments and details. 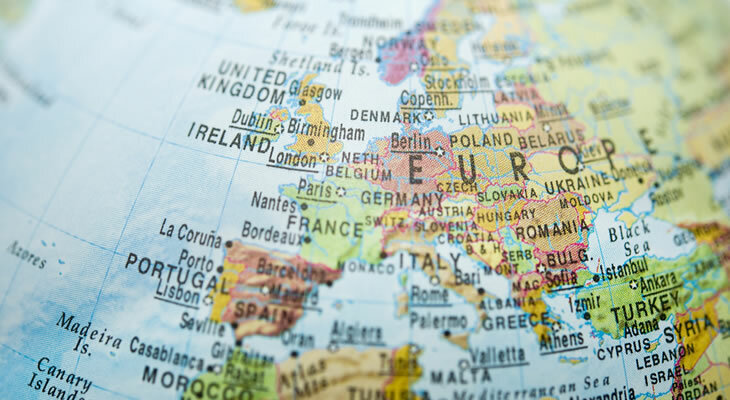 The European Central Bank (ECB) will hold its April monetary policy decision this Wednesday, but as recent Eurozone data has been relatively underwhelming and has left investors doubting that the ECB will have much reason to be hawkish any time soon. Last week saw the publication of various mixed Eurozone ecostats, which generally indicated that the bloc’s manufacturing sector was still performing at a worse rate than expected even as other aspects of the economy showed signs of improvement. Concerns about manufacturing growth and how slowing global growth and trade uncertainties are hitting the Eurozone persisted today too, limiting the Euro’s (EUR) potential for gains versus the Pound. Today’s German trade balance report from February was generally disappointing, showing that both imports and exports were weaker than expected. The Pound to Euro (GBP/EUR) exchange rate has the potential to surge this week, but it also has the potential to plummet – and it largely depends on the direction the Brexit process takes. Investors sold the Pound on uncertainty over the future of the process, but if the UK and EU are able to agree to a Brexit delay the Pound could recover in a relief rally of sorts. If the European Central Bank (ECB) takes a more cautious stance on Eurozone monetary policy during its upcoming policy decision on Wednesday, it could knock the Euro even lower as concerns about the bloc’s outlook would rise. In this scenario, GBP/EUR would climb. However, if there is no agreed delay to Brexit, the Pound could be in for a broad plummet instead as no-deal Brexit fears would take hold. Analysts generally expect a delay to Brexit will be agreed, but the uncertainty remains a core driver for the Pound to Euro (GBP/EUR) exchange rate this week.